To accomplish that elusive perfect shot and be able to repeat it, shot after shot, creating one wonderful ragged hole, you will need to control your breathing. Every time you inhale and exhale significant movement is introduced to the torso and this movement is magnified as it is transferred to the pistol. I’ll cut to the chase and tell you to simply fire at your natural respiratory pause. When you inhale, then exhale, there is a bit of a pause before you inhale again. This pause can comfortably be held for about 6 seconds, more or less depending on the person. During this pause is when you gradually increase the pressure on the trigger until the shot is fired. 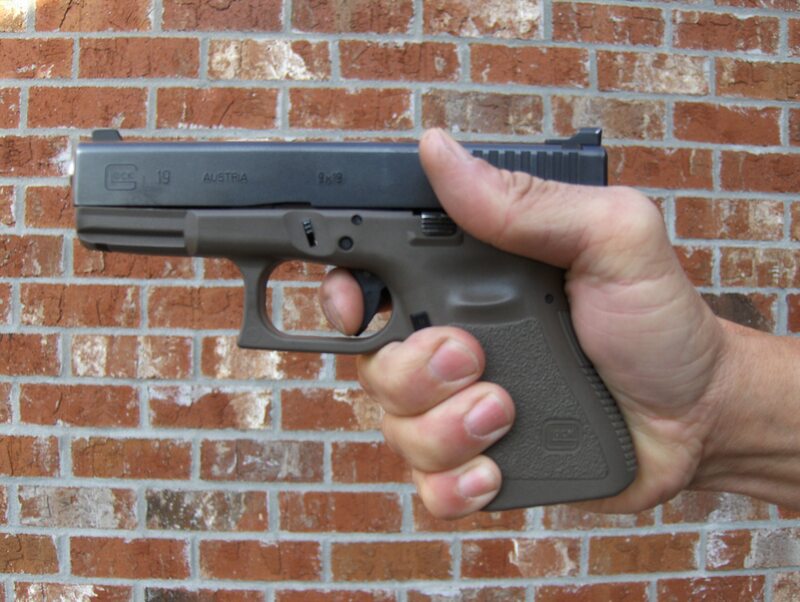 When pulling the trigger on fighting pistols such as the Glock, S&W M&P and Kahr, placing the index finger of the firing hand on the trigger about two thirds from the tip gives us the control we like. 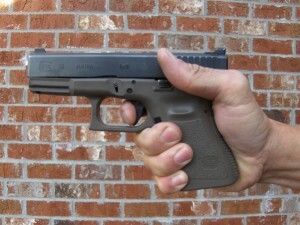 Different handguns may require a little different trigger finger placement. Any handgun with a heavy trigger pull will demand that you put more finger on the trigger, usually up to the first crease of the index finger. Double actions also are generally easier to function with the crease of the trigger finger nearer the trigger. Many pistols, especially double actions and striker fired pistols have considerable pre-travel or “slack” when pulling the trigger. Please note! Single action pistols like the Model 1911 and others may have NO pre-travel. When pulling the trigger for the precision shot, you want to take up all pre-travel in the trigger first. You take up pre-travel by pulling the trigger gently to the rear until you begin to feel increased resistance. When all the pre-travel is taken up, verify your sight picture before applying the final gentle pull that causes the pistol to fire. The actual shot being fired should come as a “surprise”. Immediately after the shot, the gun will recoil, rising slightly, or dramatically, depending on the particular cartridge being fired. Your next task will be to smoothly bring the sights back to bear on the target, and reestablish sight picture. By the time sights are back on target, most people allow the trigger finger to fly off the trigger at some point during recoil. Letting this happen introduces more movement into the process which is not a good thing. I would suggest that you hold the trigger back under recoil and reset the trigger after you have reestablished sight picture. To reset the trigger, release the trigger only as far as you need to reengage the hammer or reset the striker (Glocks are striker fired). You will know when the trigger is reset when you feel and/or hear a click. Do not allow the trigger to move forward any further. You are now ready to fire the next shot. The process of trigger reset reduces movement by eliminating the need to relocate the trigger and take up pre-travel. Unnecessary movement is thereby reduced and better weapon control is gained. Follow Through, You are faster than a speeding bullet! In projectile launching sports, follow through is important so that the accuracy of the projectile is not diminished before the projectile departs the launcher. Follow through is equally important to launching balls or bullets. Novice shooters are infamous for wanting to see where the bullet perforated the target and will often disturb the sight picture before the bullet exits the barrel causing a less than accurate outcome. The simple solution is disciplined follow through. In precision handgunning or rifle, one method of learning to apply follow through is to simply add one additional sight picture for each shot or series of shots. So, when your objective is to fire one precise shot you will have two sight pictures, one before the shot and one after the shot. When you fire five shots you will have six sight pictures. When you fire nine shots you will have ten sight pictures. The act of acquiring an additional sight picture helps insure that the shooter does not move the gun off target before the bullet leaves the barrel, thereby allowing you to send bullet after bullet to the same point on the target.